Samsung has introduced its long awaited, eagerly-anticipated Samsung Galaxy Gear at the IFA consumer technology show in Berlin Wednesday. Once this wearable device is matched to your Samsung Note 3, it will display incoming messages from the smartphone such as texts, emails and phone calls. This way you can decide if it's important enough to pick up your Note 3 or leave it in your pocket or purse. The Gear shows a preview of messages, tells you who’s calling, and lets you accept or reject the call with your fingers. It’s connected via Bluetooth 4.0 and much like when you use a Bluetooth headset in the car, you can send a call to your watch and talk hands-free. There are two built-in microphones and a speaker so call quality was surprisingly good when I tried it. The watch is bigger than I thought it would be, sporting a 1.6 inch touchscreen Super AMOLED display with a metal face and sapphire glass. It felt comfortable on my wrist, and the band is adjustable to accommodate women’s smaller wrist sizes. Anything you do on the watch itself, as long as you’re within Bluetooth range of your Note 3, is sent to the device. On your Note, you can access the settings and change defaults using Samsung’s Gear Manager app. The watch has one button on the right side which is the home button. Other than that, everything is done with swipes and gestures. Two taps on the home screen brings up watch info, time and weather. Swiping left and right gives you access to everything on the phone; photo gallery, contacts, mail, music and more. You can play your music through the watch, but since there is no headphone jack, just be aware that when you’re listening to music or any information coming from your phone, you’re listening out loud for all the world to hear. Samsung says battery life for the watch is expected to last about 24 hours depending on use, but my biggest regret for this watch is that you need an additional device for charging. Yes, you charge using a micro USB charger but there is no input for it on the device itself. Samsung says they decided to use a charging cradle in order to maintain the small form factor on the watch itself. Having just packed for an overseas business trip, I am always mindful of how many different charging devices I need to bring. I appreciate Samsung not adding to the bulk of the watch, but still, it would be nice not to have to remember one more thing to pack. 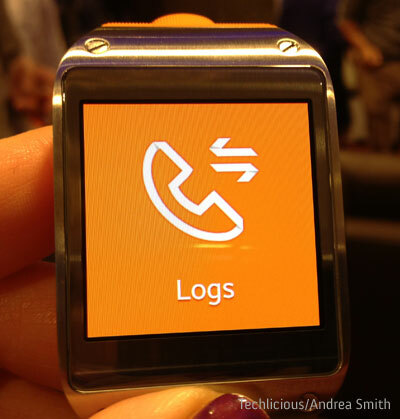 Samsung has partnered with third-party apps to run on the Galaxy Gear. Launch apps include Evernote, Path, MyFitnessPal and Runkeeper with more on the way. The 1.9 megapixel auto focus camera is located on the top part of the watch, meaning it faces out if you hold the watch up to glance at it. It made me feel like Wonder Woman taking pictures with my wrist raised up. The camera will also shoot full HD video, though only 10 seconds worth. Think of it as Snapchat or Instagram for your video camera. The photos and video are instantly synced to the gallery on the Galaxy Note 3. There’s no red light to indicate the camera is on, but Samsung tells me there is a noise to let you know a photo has been taken or video is being shot. There is a security feature that automatically locks the smartphone screen any time the Galaxy Gear is out of range. You can also use Find My Device to locate your phone if you misplace it in the house or office, sending a beep or vibration to the missing device. The Galaxy Gear is stylish, and I like the customizable features. Most of all I appreciate how it transfers the important features of your phone to a place where you can quickly see and respond to them. A glance at your wrist is more subtle and far more polite than constantly pulling out your phone to check for an email from your boss or a text from your kids. This convenience will come at a price however, and we don’t yet know what that price is. 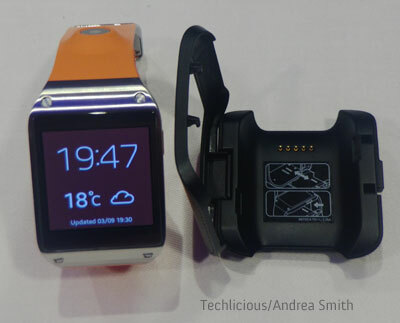 For now, the Galaxy Gear works only with the Note 3, but Samsung indicated it will work with more devices in the future. 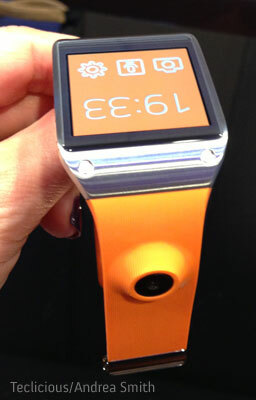 The Galaxy Gear will launch at the same time as the GALAXY Note 3 on September 25 in 140 countries and will be available in six colors; Jet Black, Mocha Gray, Wild Orange, Oatmeal Beige, Rose Gold, and Lime Green. An exact US release date hasn't been announced.